China's top legislature will send four teams of lawmakers to inspect enforcement of the air pollution control law in eight provincial-level regions across the country. Li Zhanshu, chairman of the National People's Congress Standing Committee and a member of the Standing Committee of the Political Bureau of the Communist Party of China Central Committee, presides over a meeting of the NPC Standing Committee on inspecting enforcement of air pollution control law, in Beijing, capital of China, May 7, 2018. The lawmakers convened their first plenary meeting here Monday. The inspection is aimed at pushing the whole Party and nation to willingly adopt the new development concept and effectively implement major environmental policies made by the Communist Party of China Central Committee, said Li Zhanshu, chairman of the National People's Congress Standing Committee and a member of the Standing Committee of the Political Bureau of the CPC Central Committee, who presided over the meeting. The inspection will also address outstanding environmental issues of public concern, press governments at all levels and businesses to carry out their duties, and raise public awareness, Li said. 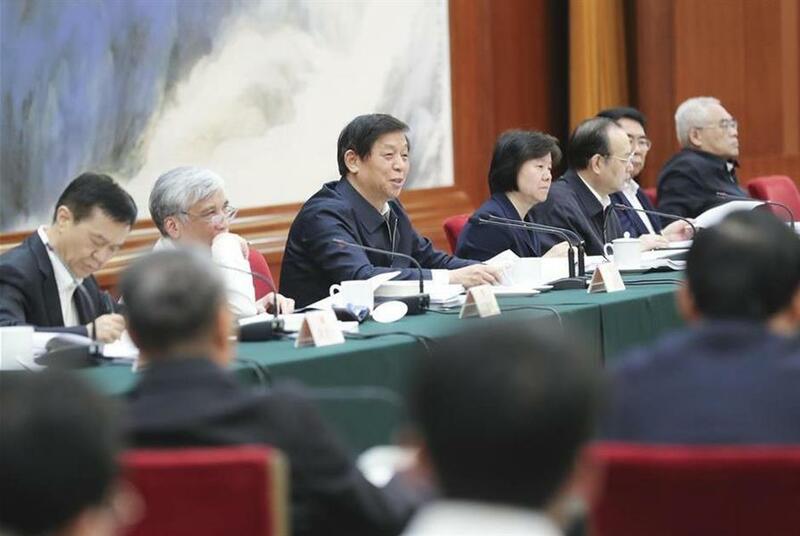 He instructed lawmakers to follow due process and carry out their duties rigorously, target red-flagged regions and sectors and the prominent problems that harm the interests of the public, and put forward practical and effective solutions. He also warned them against any form of bureaucracy. In addition to sending inspection teams, the NPC Standing Committee will also entrust standing committees of the remaining 23 provincial-level people's congresses to inspect the enforcement of the law within their jurisdictions.